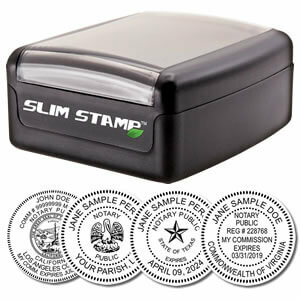 Slim Official Round Notary Stamps are discreet and noiseless. Slim stamps differ from self-inking stamps because of their eco-friendly internal inkwell that can last for thousands of impressions before needing to be re-inked. This Slim Official Round Notary Stamp is great for notaries who are on-the-go and need a durable and portable stamp. Unsure if this Slim Official Round Notary Stamp is the right stamp for you? Contact us! Our Slim Official Round Notary Stamp is a wonderful tool for mobile notaries. You will receive a beautiful and lasting impression from the Slim Official Round Notary Stamp every time it is used. This slim notary stamp can be used for thousands of impressions before the need to re-ink the built-in ink pad making it an eco-friendly choice. Your seal is guaranteed to match all state specified requirements. WHAT IS SO SPECIAL ABOUT PRE-INKED STAMPS? Pre-inked stamps are a great addition for any professional - especially notary publics. When creating your Slim Official Round Notary stamp, we use a flash lighting process to transfer the seal to durable foam that will be inserted on the bottom of the stamp which is then inked with an oil-based ink. Since pre-inked stamps take oil-based ink, they tend to last longer and give crisp impressions every time. If you are looking to reduce your carbon footprint, a pre-inked stamp is the perfect product for you. Pre-inked stamps are made by an environmentally-friendly process and do not use replacement ink pads which cuts back on excess waste throughout your usage of the stamp.